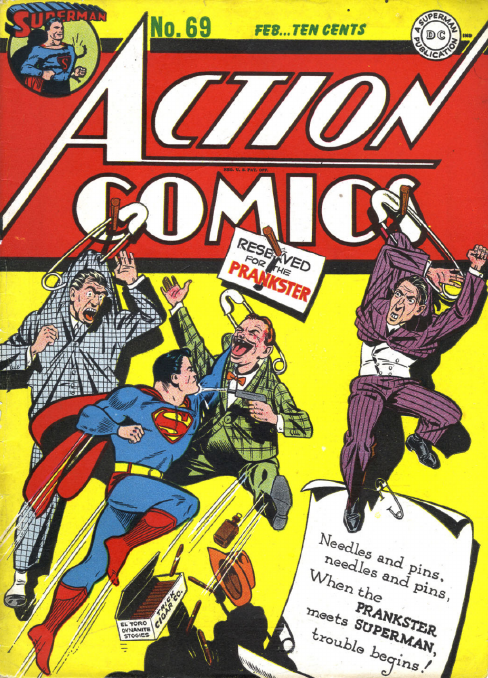 That’s quite a flood on the cover of Action 144 (May 1950), but it’s not nearly as interesting as the story of how Clark Kent came to be hired at the Daily Planet. 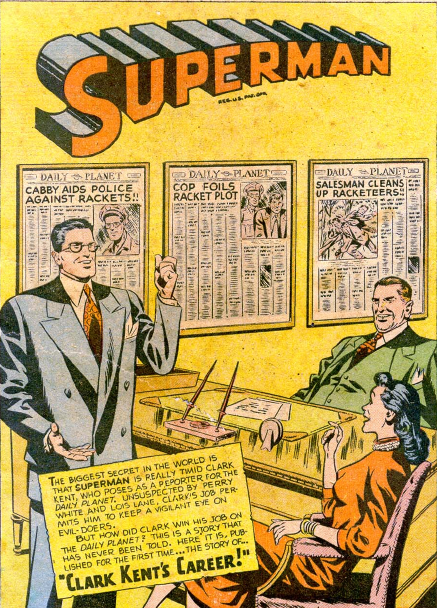 Schwartz, Boring and Kaye delve into the past, as they recount the events that lead to Perry White hiring Clark Kent to work at the Daily Planet. 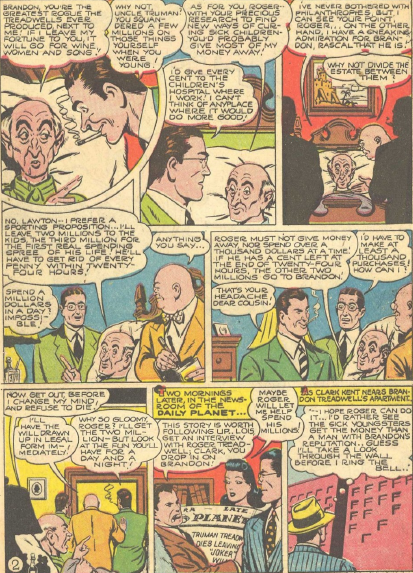 The story is told in flashback – and a flashback within a flashback, as Clark arrives in Metropolis, and recalls Perry visiting him in Smallville, and promising him a job. 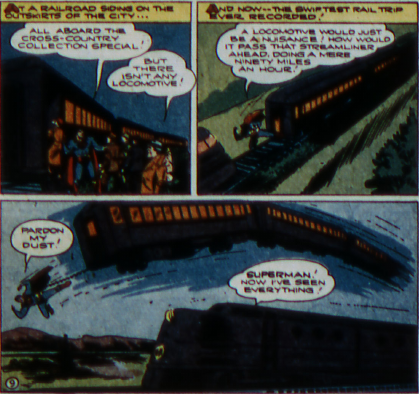 The story being referred to in this scene would actually come out a month later, in the pages of Adventure Comics. And both that story and this one have pretty much the exact same format. 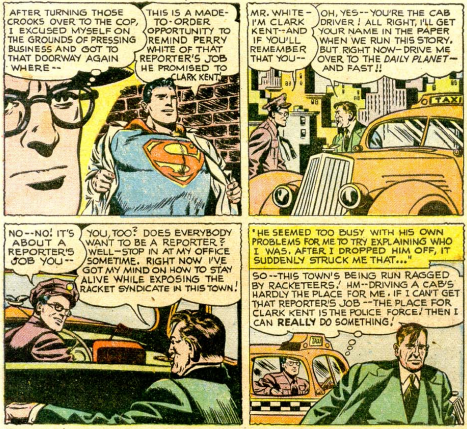 Clark Kent takes on a number of jobs, trying to get Perry White’s attention. Along the way he stops crimes as Superman. As an adult, the first time he runs into Perry is while working as a cab driver. 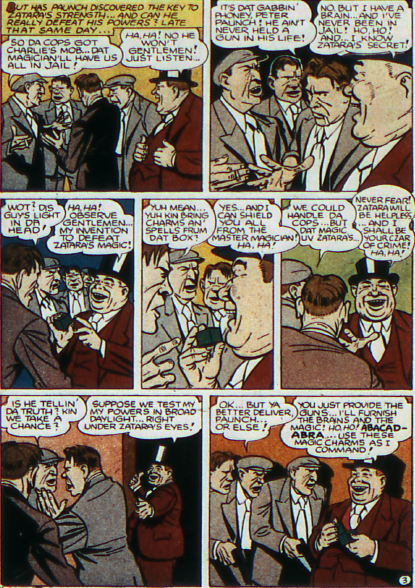 Clark attempts to remind Perry of his earlier promise, but the editor is all caught up in a story, and pays little attention to Clark. 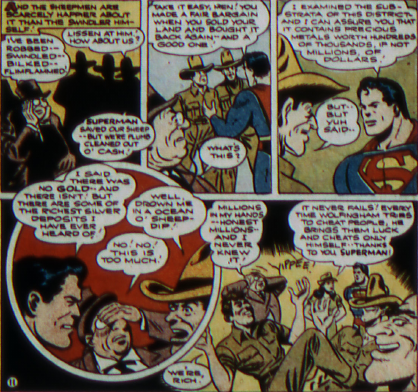 Only at the end, when Clark turns in a Superman story, which gets picked up by the wire services, does Perry recall having met Clark years before, and fulfills his promise to kill him. 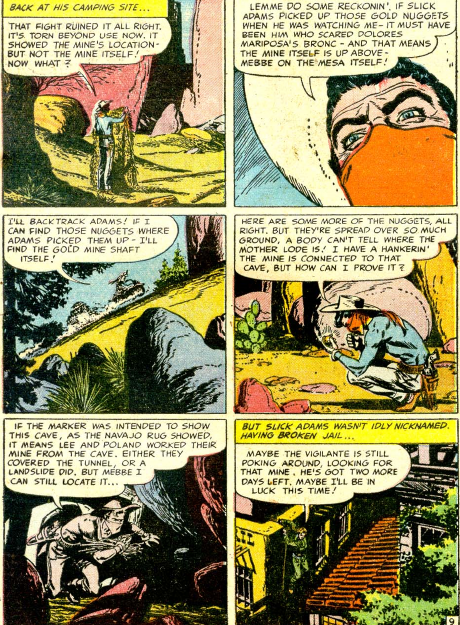 Gardner Fox and Dan Barry tell an entertaining story, based on the legend of the Lost Dutchman Mine, with some really great art. In this case, two men fought to the death after finding the mine. 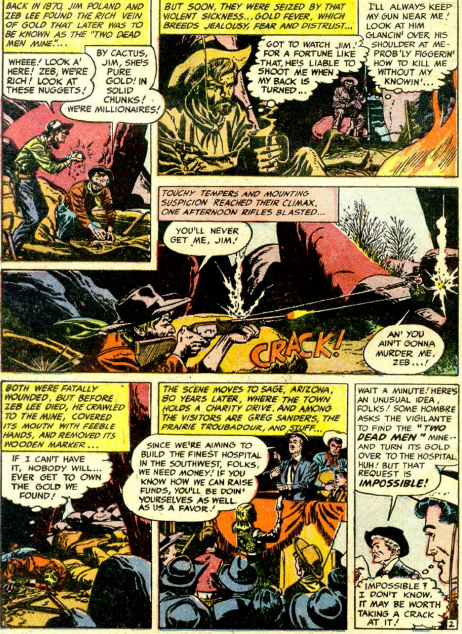 And in some nice parallel structure, the Vigilante and another man compete to find the lost gold mine. Stuff has only a small role in this tale, which helps keep the intensity up. 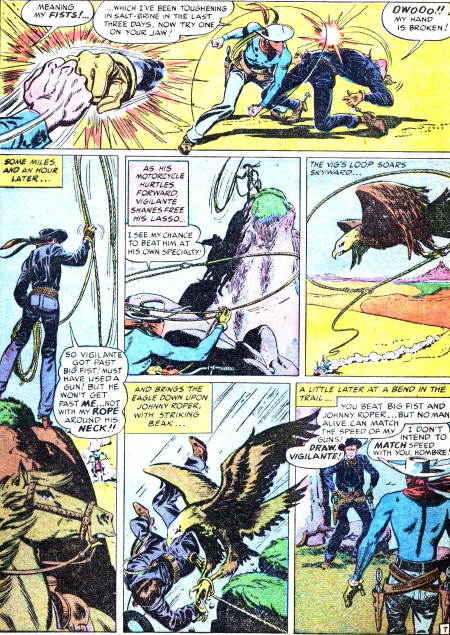 Vigilante finds a native blanket, which shows the fight to the death, and uses the landmarks shown as a treasure map. I really like Dan Barry’s art, and overall, the Vigilante series had stronger than normal art throughout its run. 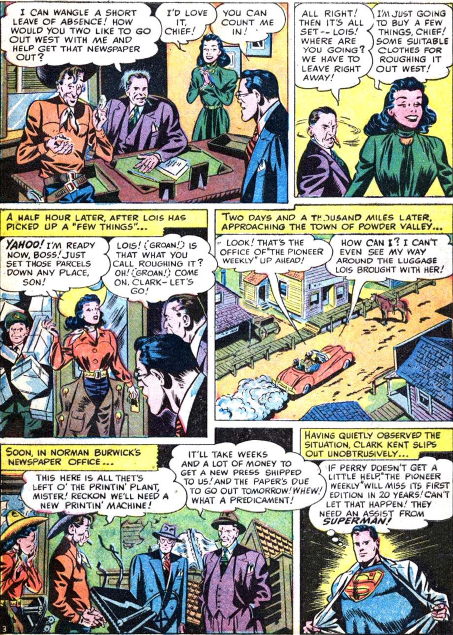 William Woolfolk scripts the Superman story in Action 134 (July 1949), with art by Boring and Kaye. 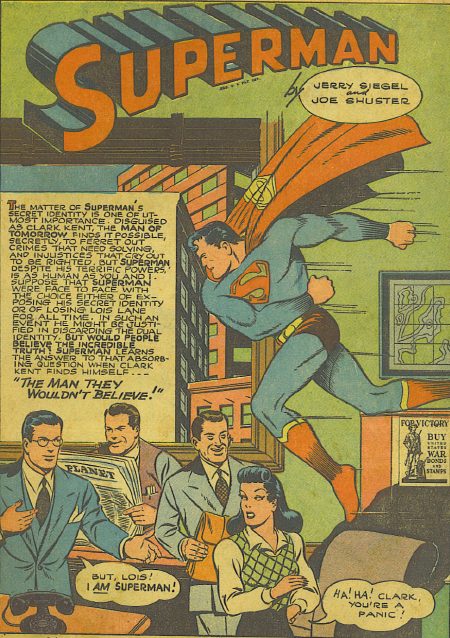 In what very much feels like the opening to a late 50 or early 60s story, a man comes to the Daily Planet, asking for help running a crusading rural newspaper. Perry White thinks this is a great idea, and orders Lois and Clark to come with him. The story actually deals very little with the rebuilding of the newspaper, and dives instead into the western environment. 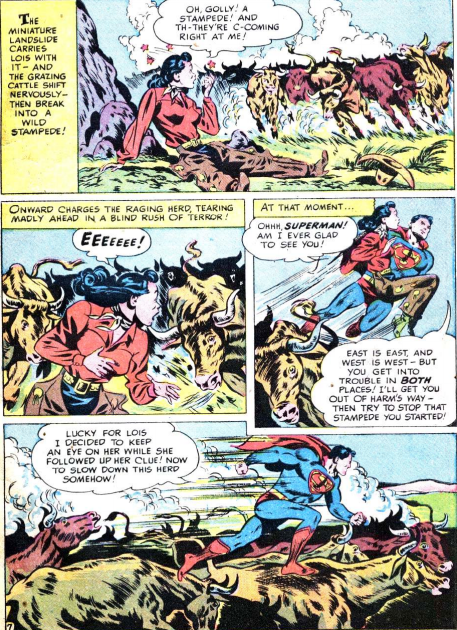 Superman may not ever put on a cowboy hat, but he does spend most of the story dealing with cowboy-type problems, like rescuing Lois from a stampeding herd. Binder, Swan and Fischetti deal with the economics of 1989 in this tale. 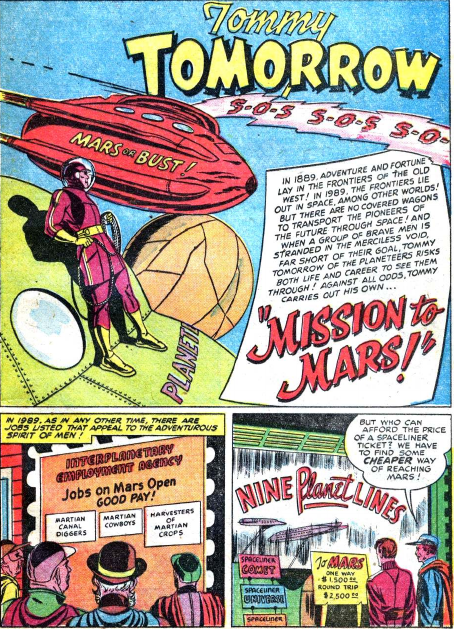 Mars needs workers, but the price of travel there is prohibitive. A man is selling contained space suits, advertised as being able to make the entire voyage for a very low price, and gets many takers. The men get stranded partway there, as the suits are not even close to being able to do the trip. Tommy, as colonel in the Planeteers, captains the ship that rescues them. But the men accuse him of not caring about their situation, when he announces that he will return them to Earth. 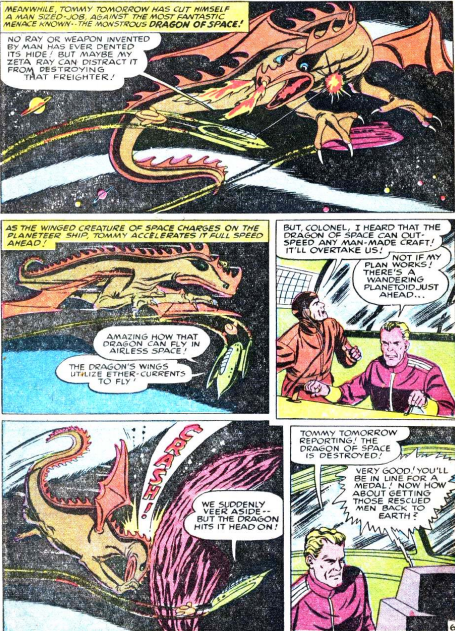 So Tommy finds a variety of reasons to keep moving his ship towards Mars, including fighting a space dragon. The creatures ability to fly in a vacuum is ascribed to ether-currents. Whatever they are. 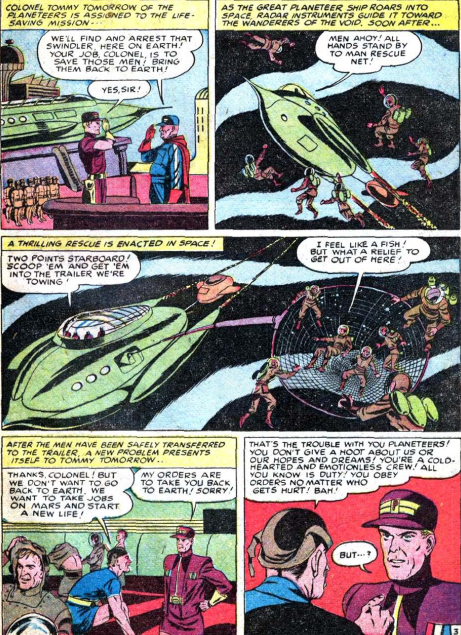 The other Planeteers on the ship work to repair and upgrade the suits, and Tommy releases the men close enough to Mars that they can complete the journey. 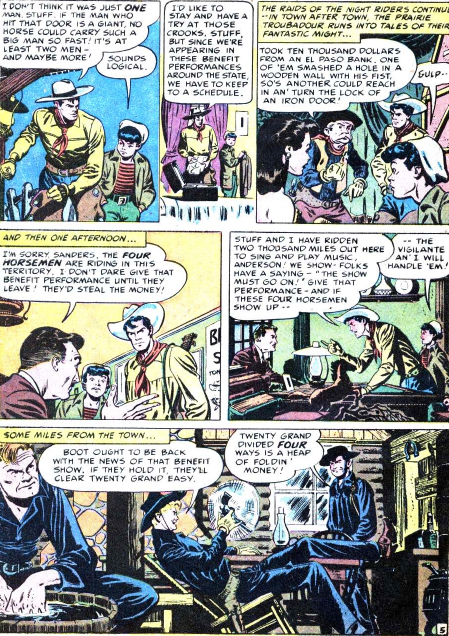 Vigilante has to face a team of murderous thieves in this story by Gardner Fox and Dan Barry. The Four Horsemen of Villainy wear identical black garb, and for a while, people think there is only one man, capable of astounding feats. People are so frightened that Greg Sanders finds his show has been cancelled. 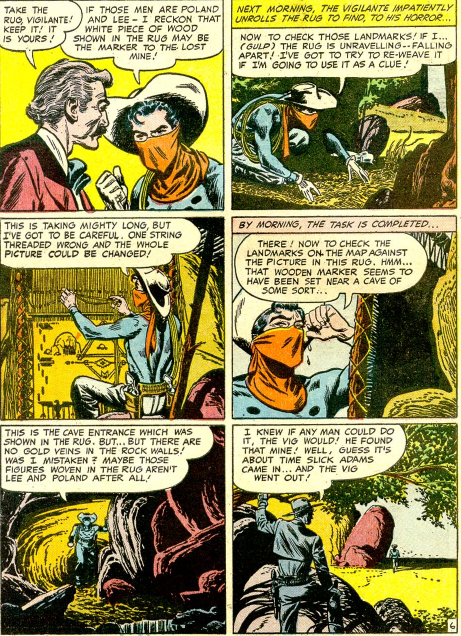 He is pretty mad about this, as he and Stuff travelled all the way out there, so he gets into his Vigilante costume and starts tracking the Horsemen. He figures out that there have to be more than one man. 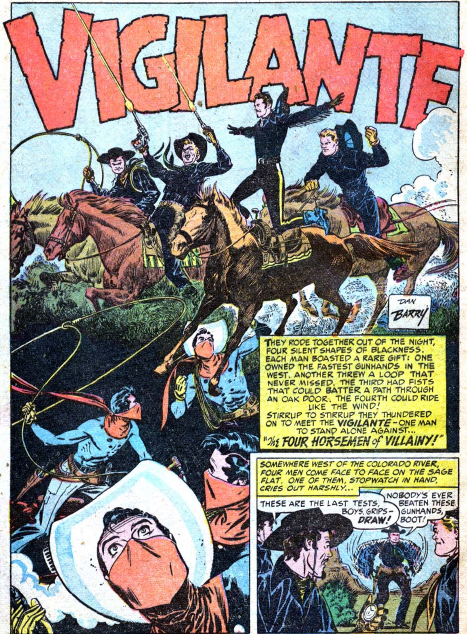 The climax leaves Stuff to the side, as Vigilante fights and defeats all four of the horsemen. 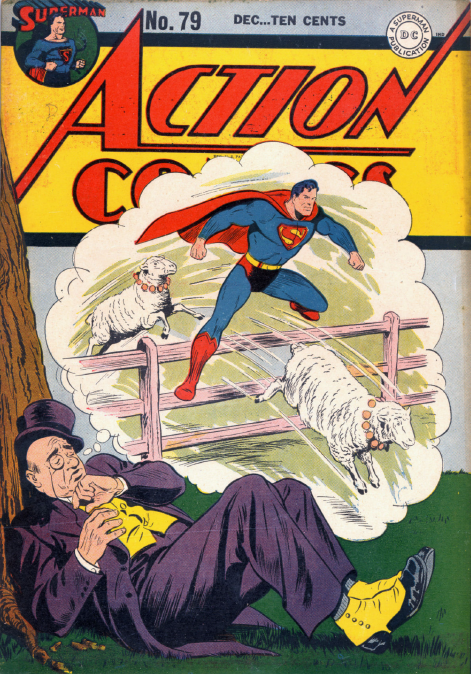 Action 79 – Superman vs J Wilbur Wolfingham, the Fiddler teaches birds to sing, and a charm against Zatara? 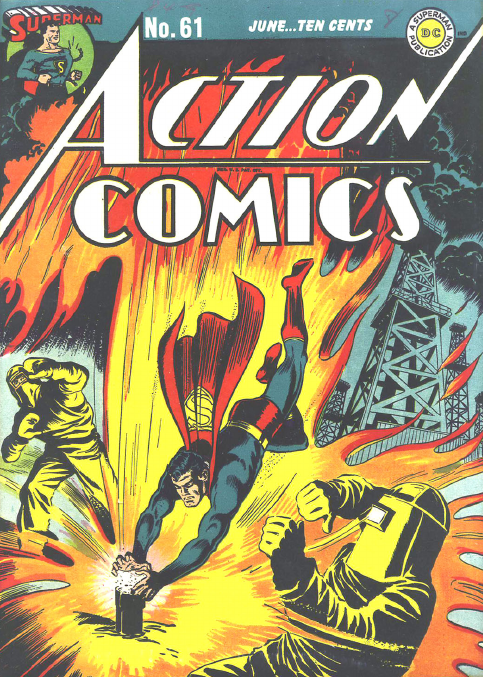 J Wilbur Wolfingham, a frequent adversary in the pages of Superman, makes the cover of Action 79 (Dec. 44), the first time he appears in this book. Sadly, it’s really not one of his better stories. Don Cameron and Ira Yarborough seem to be going through the paces on this one. Wolfingham buys up a lot of land, then convinces the seller that there is gold on the property, so they will buy it back at higher prices. 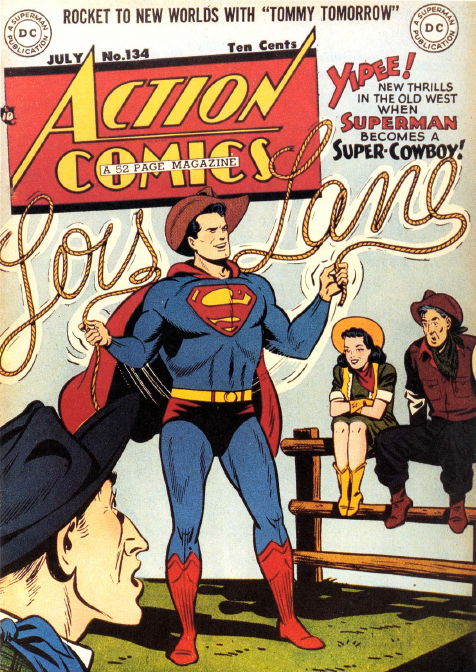 Superman outwits Wolfingham, and the land owners learn that there is silver, not gold, under their land. And Wolfingham winds up broke, if not in prison. Wolfingham is always a con artist, but usually a better one. The look of his character is based on W.C. Fields. 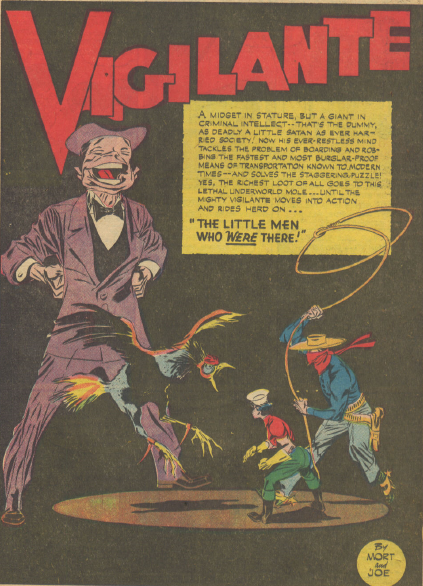 Joe Samachson and Mort Meskin also seem a little tired in the Vigilante story. The splash page is great, and the story idea itself is pretty good. The Fiddler has figured out how to teach birds to sing like humans, and puts his teaching skills on the market. He cases the homes of those who hire him – essentially the same set-up as when he impersonated the music teacher. From there on, the story is all the usual formula. Vigilante and Stuff fall into his hands. Fiddler puts them in a deathtrap, from which they escape. They defeat him and send him back to prison. And finally, in this issue I find somewhat disappointing, comes a Zatara story by Fox and White that almost makes me angry. 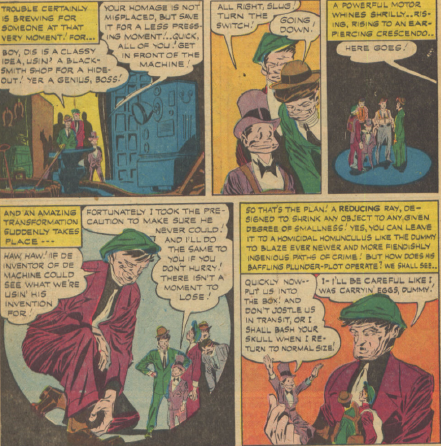 A man claims to have figured out how to neutralize Zatara’s magic, and sells hoodlums a special box, containing the secret. 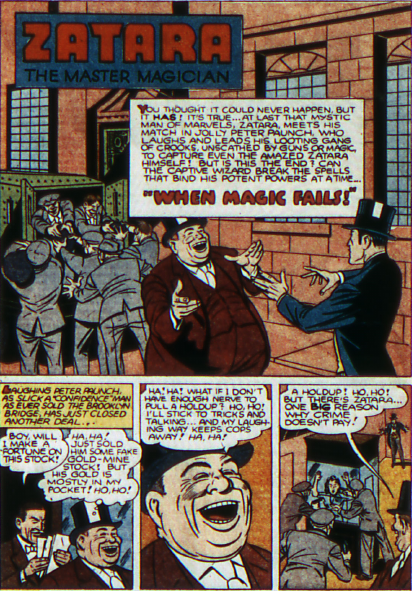 More amazingly, this winds up working, and the bad guys are indeed immune to Zatara’s spells. Zatarais mystified, but shows off some other abilities, which he uses to make some deadly dogs turn into friendly and helpful allies. Where this story gets me is the explanation. 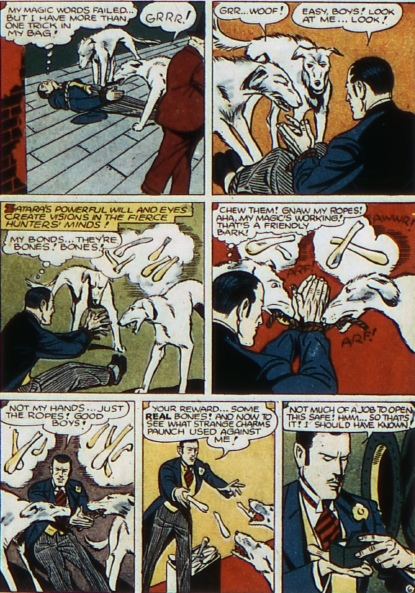 The “secret” turns out to be ear plugs – and the idea behind this that if one cannot hear Zatara’s spells, they will have no effect. This makes absolutely no sense. Often his spells are cast an inanimate objects, or on people at a distance, who could not possibly hear him. 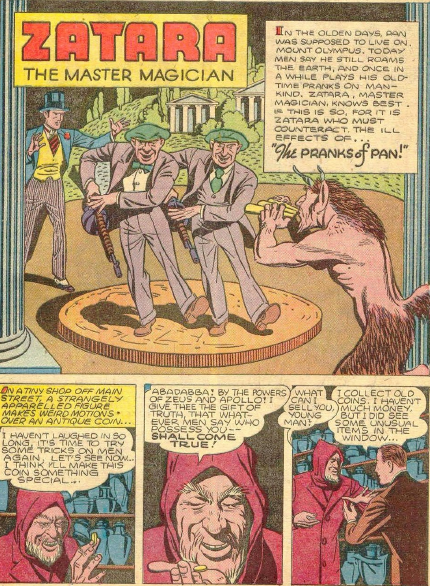 Don Cameron and Ed Dobrotka give the Prankster one of his more devious schemes in Action 77 (Oct.44). The Prankster takes over a newsstand in the business centre of town, and makes a deal with a failed entrepreneur. 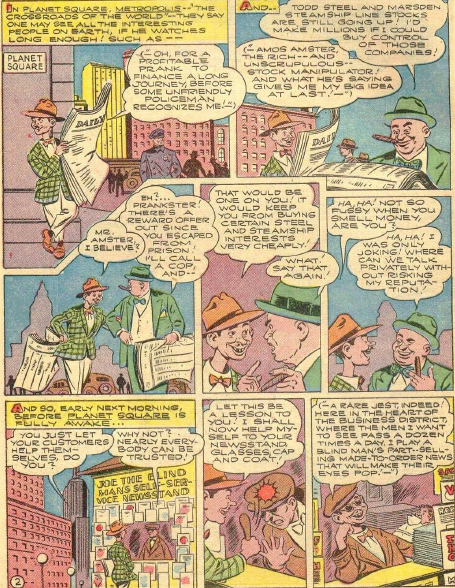 The Prankster sells men fake copies of the Daily Planet, with news of the destruction of their factories or resources, and the businessman then quickly buys their company at a low price. Of course, it’s not long before the Planet gets involved. 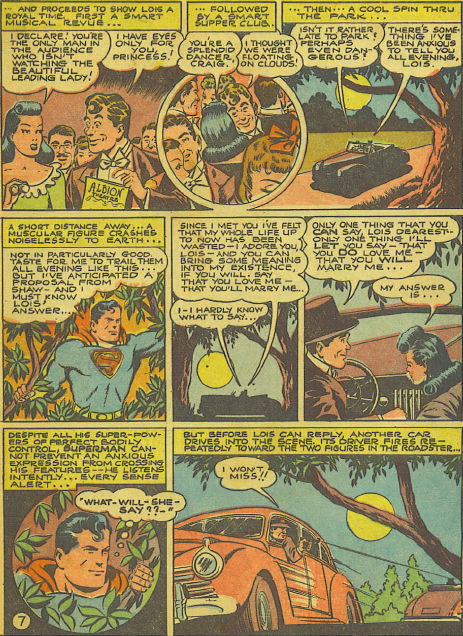 Lois Lane and Clark Kent both have their names attached to phony stories. 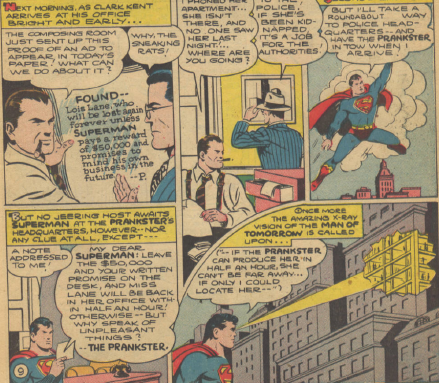 Superman figures out what has happened, but the Prankster has another twist to his plan, forcing his dupe to sell the companies to him for pennies, so the Prankster can then sell them back to their owners at hugely inflated rates. 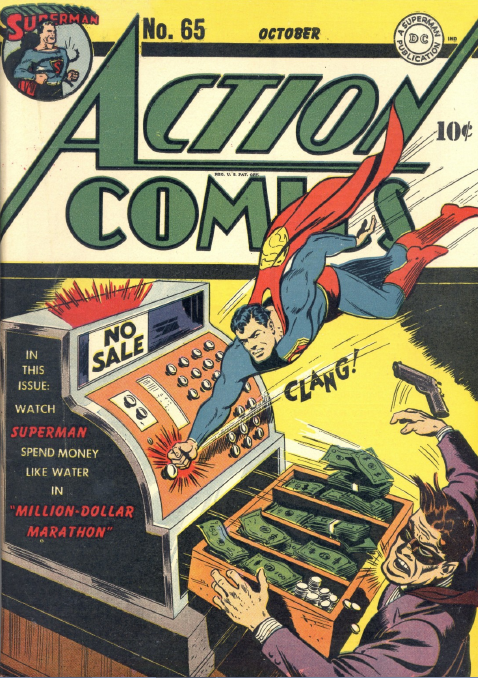 Superman then steals what the Prankster has bought, making everything worthless again. It takes a while, but Superman finally makes sure that everyone owns what they did at the start, and the Prankster is back in prison, for a few months at least. 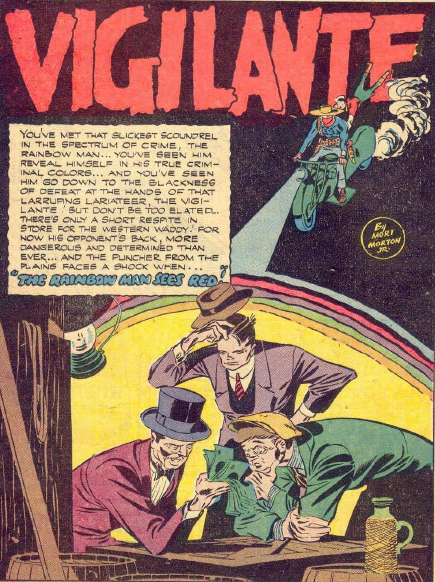 Mort Meskin gives the Rainbow Man a really hard time in this month’s Vigilante story. The Rainbow Man’s men take advantage of the lax security when their boss is taken to the hospital, and break him out. 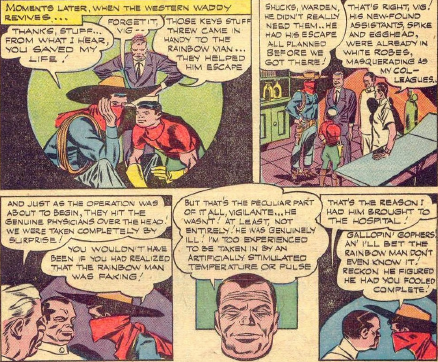 Vigilante and Stuff learn from the doctor that the Rainbow Man really is quite sick, but doesn’t realize it. In an enjoyable twist, Rainbow Man’s illness gives him colour-blindness. Ignoring his own men’s objections, Rainbow Man wears a green suit to match others wearing red. Vigilante spots him immediately, but wonders what his motive is in wearing the wrong colour. 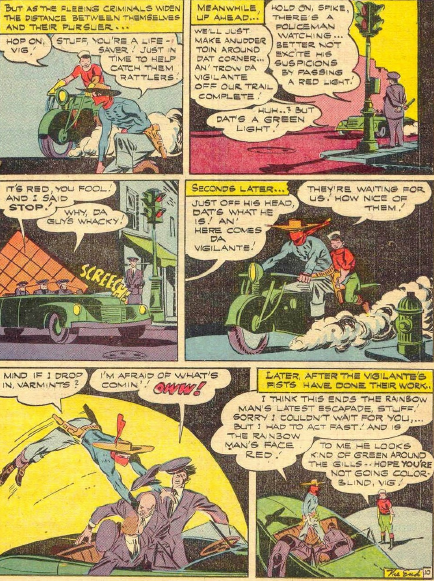 Eventually Vigilante figures out the colour-blindness, but Rainbow Man basically does himself in, stopping his car at a green light, thinking that it’s red. 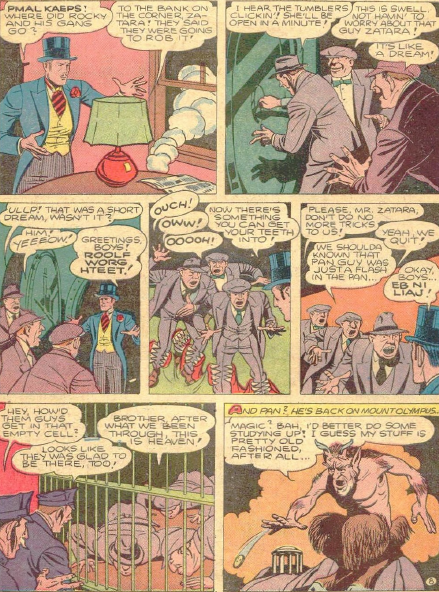 In the best Zatara story in a long, long time, Gardner Fox and William White pit the hero against the Greek god Pan. For his own amusement, Pan creates a coin that makes the owner’s every wish come true. 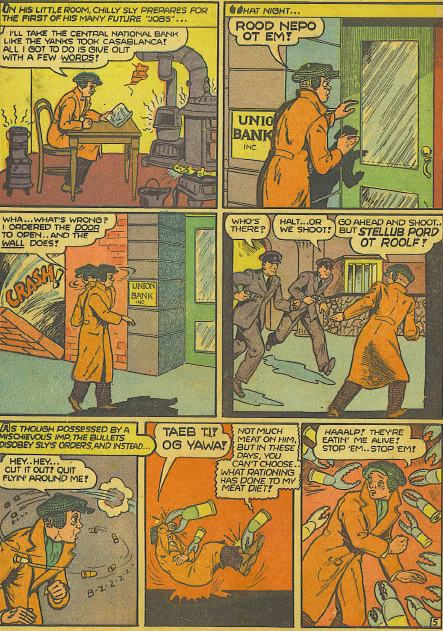 Pan ensures that the coin eventually winds up with criminals. For a while now, Zatara has been casting complex spells simply by saying them normally, and the “be it so” backwards. Kind of a cheap shortcut. 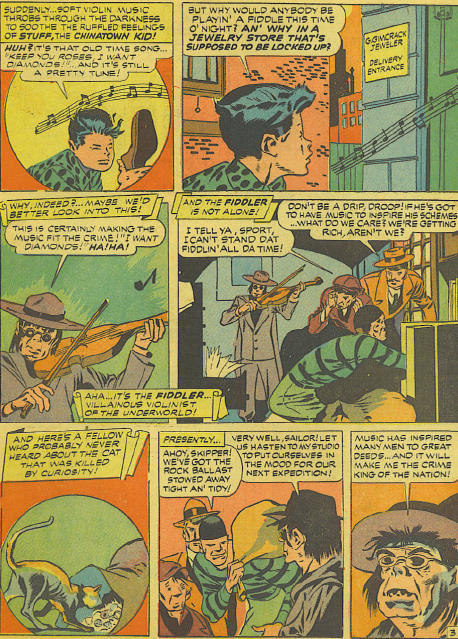 Still, Zatara does an impressive job outwitting Pan and the gang of thieves. 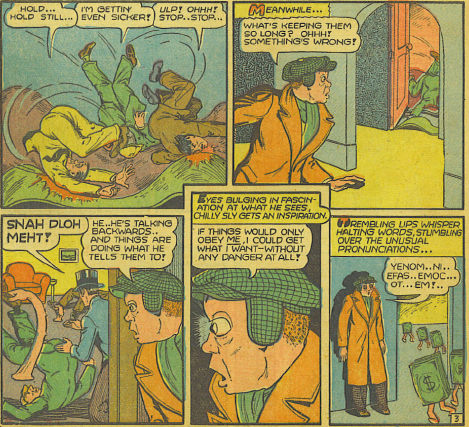 The Prankster returns in a story by Sam Citron in Action 69 (Feb. 44). 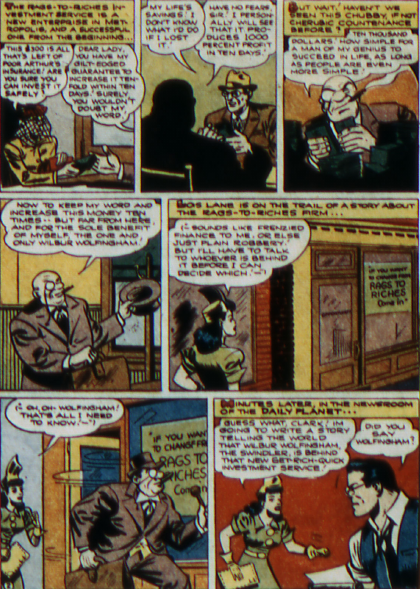 The story deals with preposterous ads about lost items, which run in the Daily Planet. The first is for a needle in a haystack, which winds up starting a stampede. The items are actually rare, and stolen, and the Prankster’s ads elicit a blackmail payment as a reward. Lois and Clark take a while to piece the story together, and it’s made even harder for them as the Prankster’s men pretend to be Planet reporters, extorting money to keep the true story from the papers. 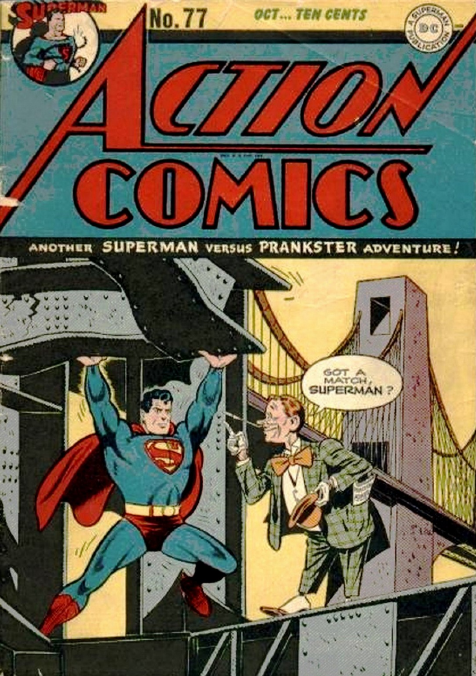 The Prankster’s scam only really falls through when he kidnaps Lois Lane. Astoundingly, the Planet has no trouble running the ad about this, although they do send the copy to Perry White before the paper goes out. 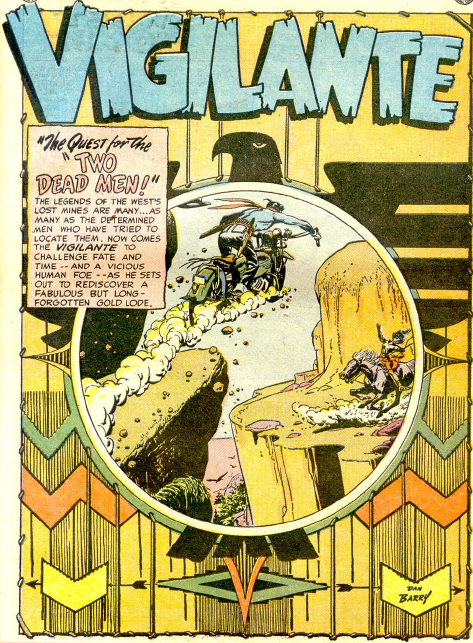 Samachson, Meskin and Kubert produce one of the best Vigilante stories in this issue. The Dummy steals an experimental machine that can make people smaller. He first uses it on himself and his gang, so they can pull off an impressive in-flight robbery. 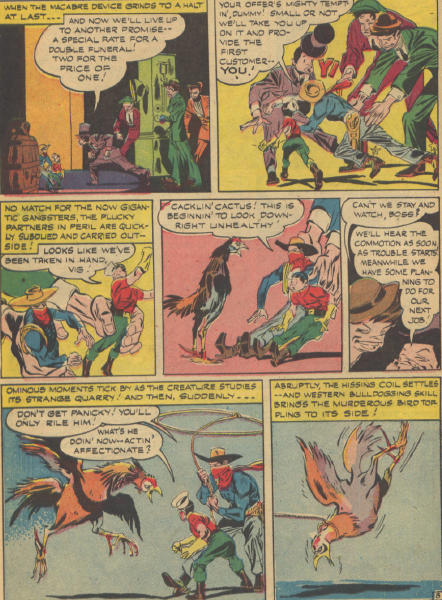 Vigilante and Stuff get on his trail, but the Dummy uses the machine on them, and leaves them prey to a chicken. I just love that sequence. 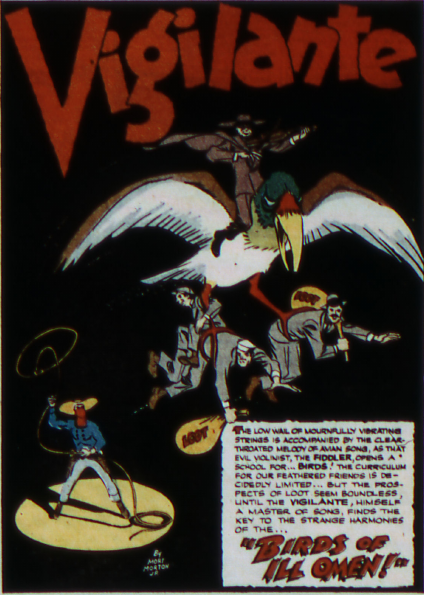 Vigilante and Stuff manage to survive until the effect wears off, and then turn the tables on the Dummy, capturing and shrinking him (again), and bringing him to jail in a birdcage. 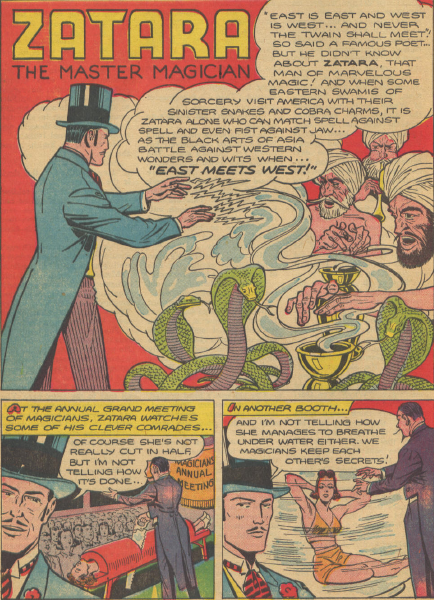 Gardner Fox and William White pit Zatara against two Eastern mystics in this story. It touches on racist, with the Hindu magicians, but avoids the extremes common in the era. 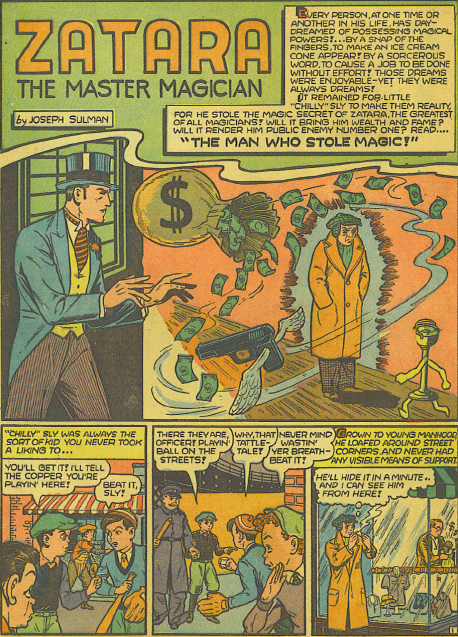 The two men are shown to have magical powers equal to those of Zatara. He manages to defeat them largely through subterfuge, and then by knocking them out with his fist. Still, the Hindu mystics are not shown to be phonies, or cowards, or anything other than criminally bent. 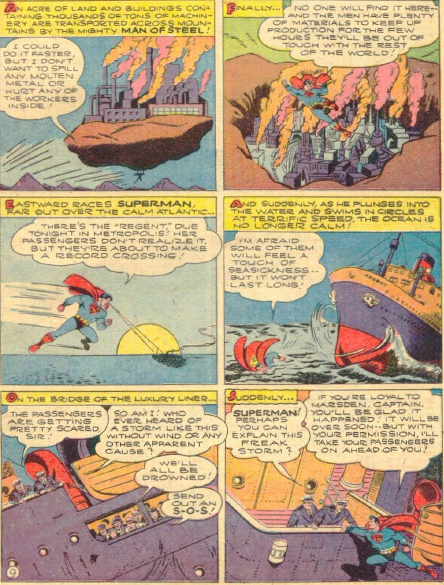 Cameron, Dobrotka and Roussos combine Superman with the plot of the movie Brewster’s Millions in Action 65 (Oct. 43). A dying millionaire has two possible heirs, a responsible lad, and a wastrel. He leaves all his money to the good boy, on the condition that he spend a million dollars the first day. If he fails, the money will go to the other one. 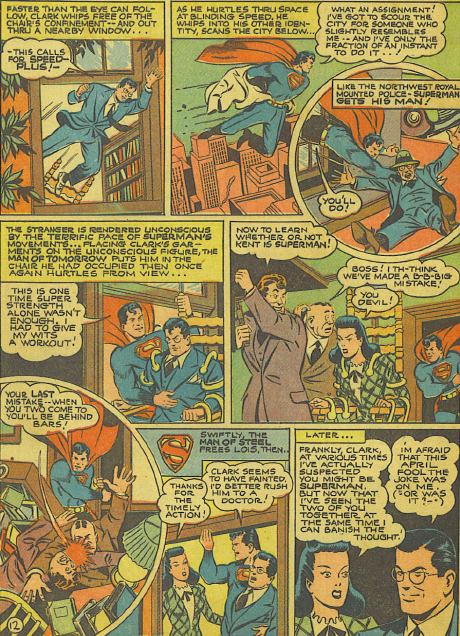 The Daily Planet runs a story on this, which attracts Clark’s attention, and Superman decides to help the boy. It makes for an enjoyable, but lightweight tale. 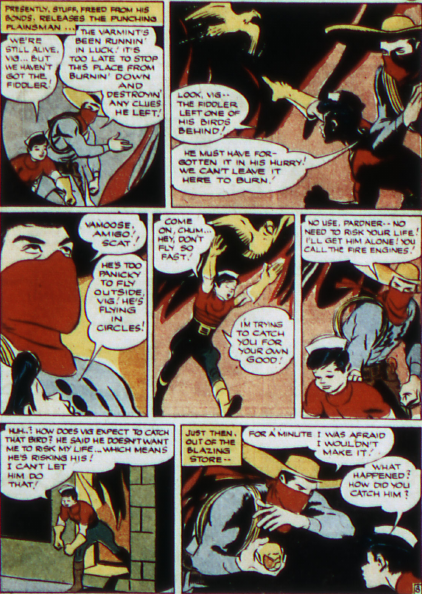 The rival heir tries to sabotage the other boy, which gives Superman some criminal activity to fight. But that’s really secondary to the plot. 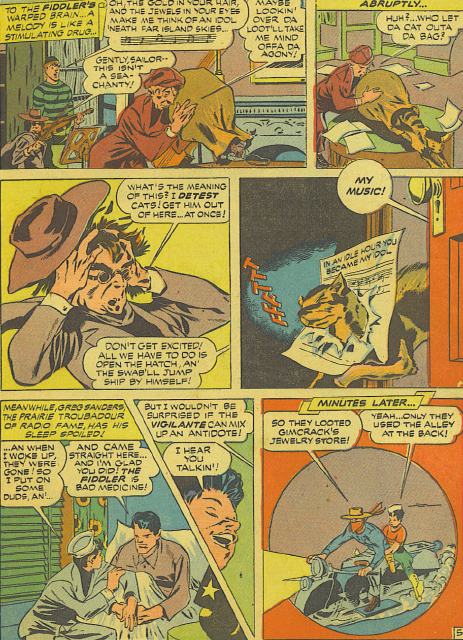 Fox and Sulman tell a story about a director who tries to inspire his student actors using masks conveying emotion in this Zatara story. By far the most striking thing in this tale, for me, is the row of emotion masks. They get used by criminals who put sleeping powder in them to knock out the students, but that’s not the important thing. 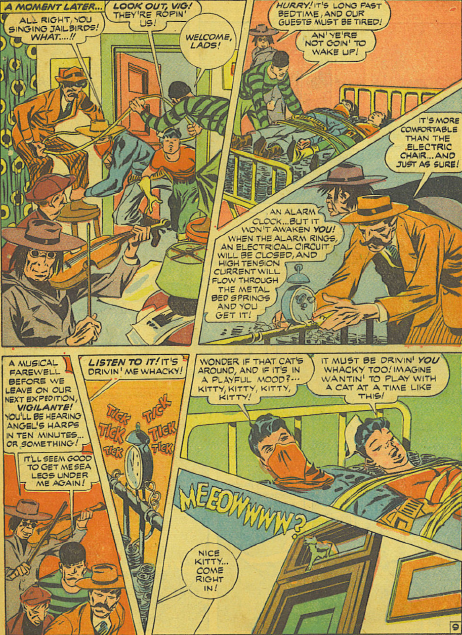 They bear a distinct resemblance to the Medusa Masks, introduced in the 60s with the second Psycho-Pirate, in a story also written by Gardner Fox. So the masks may well be the same as the Medusa Masks, which makes the story painfully ironic. The criminals had something extremely powerful in their hands, but no idea what they had. 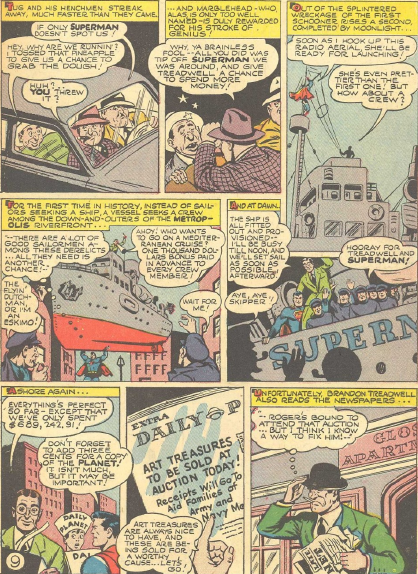 It’s not a military cover on Action 61 (June 1943), but it’s not related to the story, either. Kind of a shame, as the cover is very effective. Jerry Siegel and Ed Dobrotka are behind this twisting and entertaining story. The story begins by introducing a wealthy young wastrel, Craig Shaw, who starts a fire at a nightclub for his own amusement. Disaster is only averted by Superman. 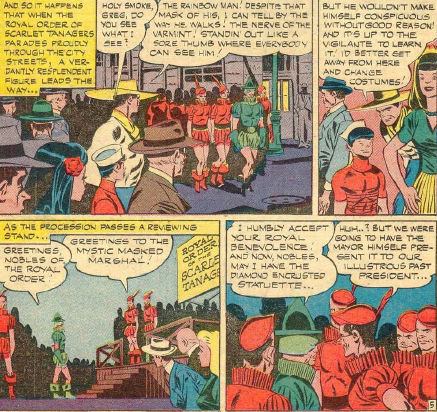 Lois and Clark were at the club, and Lois writes a scathing article about Shaw. Shaw is enchanted by Lois’ anger and outspokenness, no woman had ever talked to him that way before. 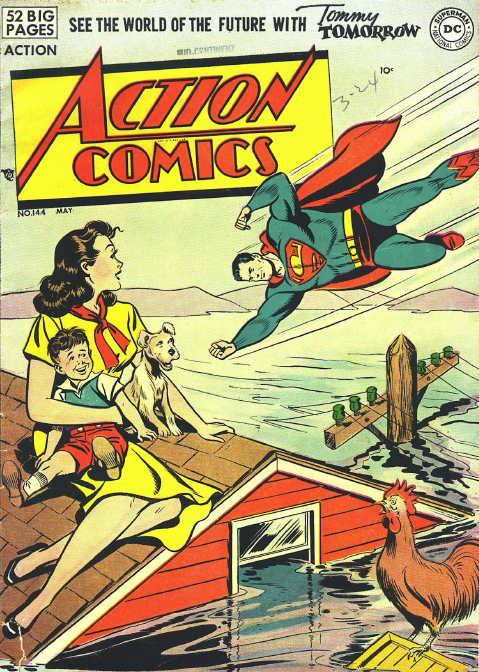 They begin dating, as a worried Superman spies on Lois. 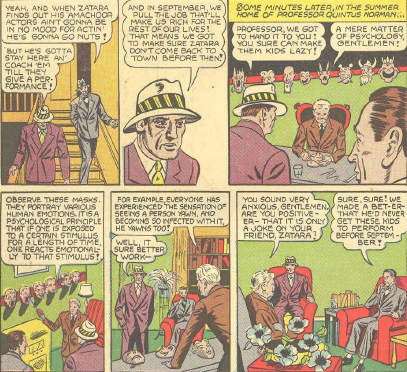 Shaw proposes marriage, and Lois accepts. This drives Superman near into a frenzy. 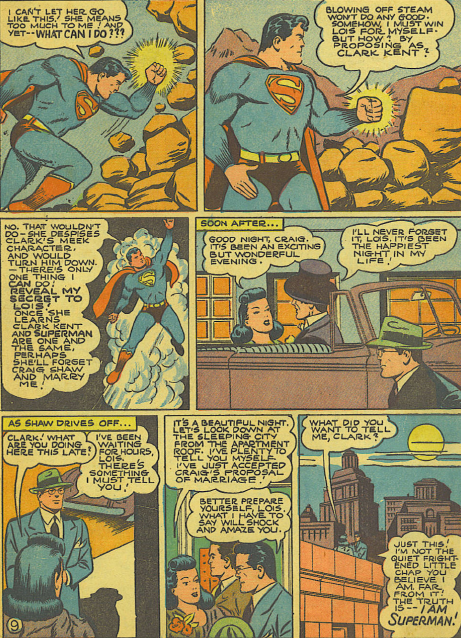 He decides to propose to Lois as well, as Clark. And he reveals that he is Superman. 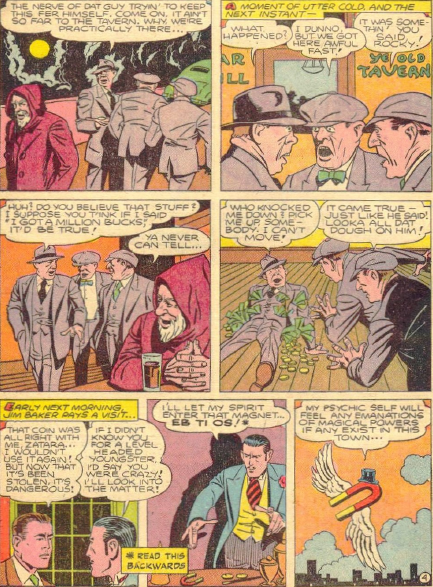 Lois refuses to believe him, and the story moves into slapstick, as Clark’s attempts to prove that he has powers keep backfiring on him. 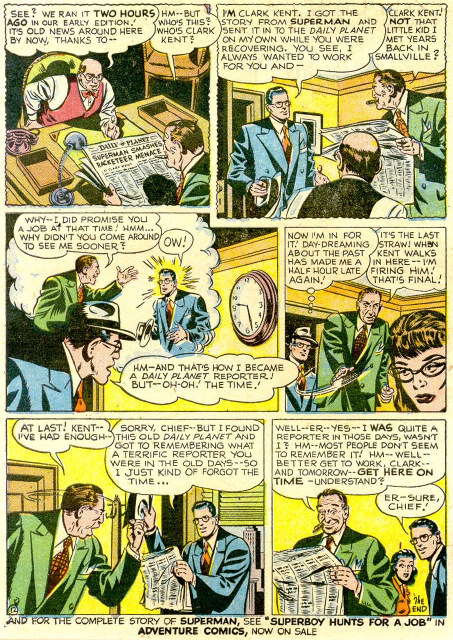 Then the situation gets even worse, as he discovers that Lois never had any interest in Shaw, and was just getting close to him for her story. Shaw, meanwhile, proves himself to be much more criminal than anyone suspected. 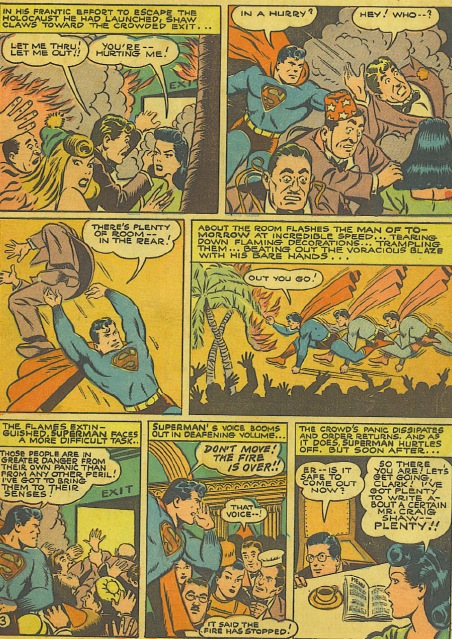 Now Clark has to try to prove that he is NOT Superman, and winds up kidnapping and knocking out a man on the street in order to appear to be both men at once. Again, this type of story will be told many times in the future, but this early version is one of the best. 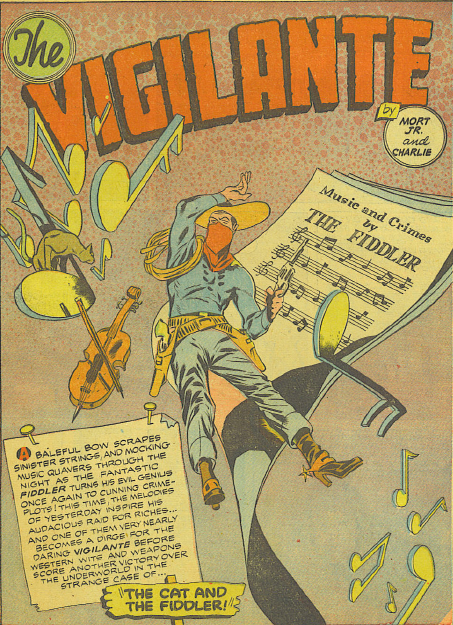 The Fiddler returns to face the Vigilante again in this Cameron/Meskin/Paris story. This time the Fiddler accompanies his men to their crimes – no more need for subterfuge now that his identity is known. He plays his music for inspiration and mood, rather than communicating instructions. We discover that the Fiddler hates cats, and a howling kitten does a lot to help Vigilante and Stuff in this story. 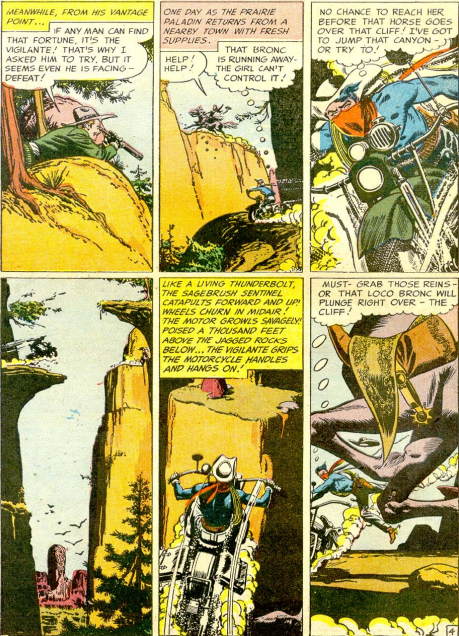 Notice Vigilante’s motorcycle in the final panel. This has become a much larger machine than it started out as. There were no big dramatic changes with the cycle, more like small modifications from issue to issue, which will eventually create his famous cycle. There is another interesting deathtrap, an electric bed, which Vigilante and Stuff get tied to. The cat proves critical to escaping it. The Fiddler returns a few months down the road. Congo Bill has left Africa to fight the Nazis again, in this story by Samachason and Smalle. Istanbul is the location for this tale. Love the splash for the story. The story itself is really a spy thriller, with Bill having to trap spies from the German embassy. Not really any use of jungle skills or such. 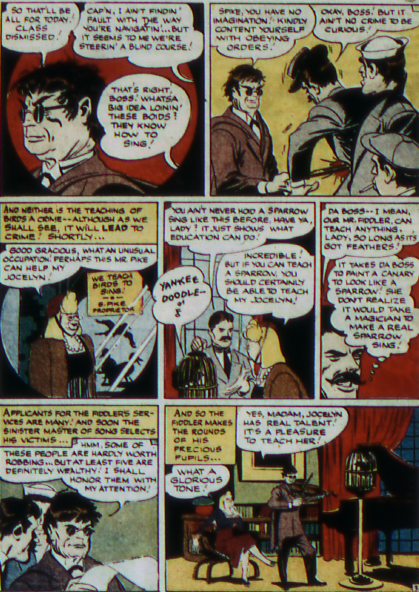 Gardner Fox and Joseph Sulman spread the powers around in this month’s Zatara story. 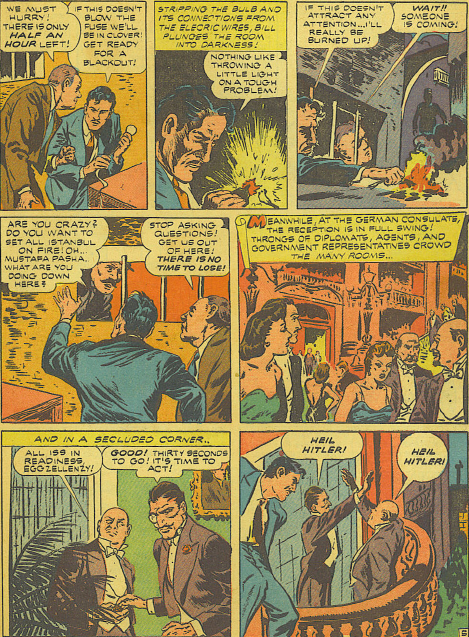 A man, who must have particularly good hearing, realizes that Zatara is speaking backwards to cast his spells. From having all manner of magic abilities early in his run, his repertoire has reduced and stabilized to the backwards talking by this point. 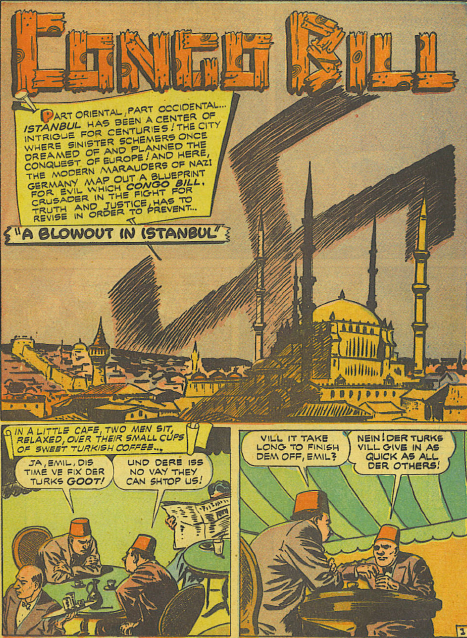 Still, it’s impressive that the man can figure this out simply by hearing Zatara. He tries the backwards speaking himself, and finds that it works sometimes, but not others. 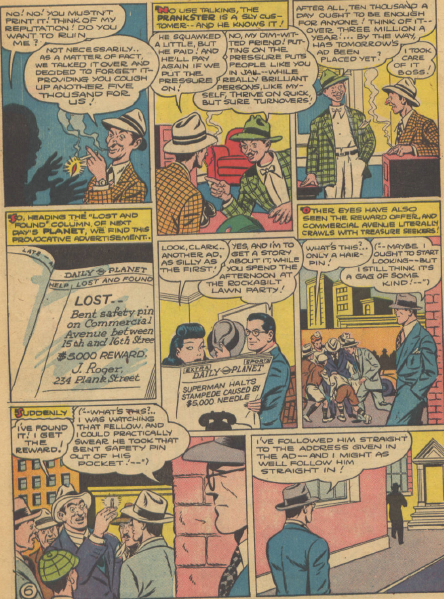 His crime spree is not nearly as successful as he had hoped, and Zatara gets on his trail pretty fast. 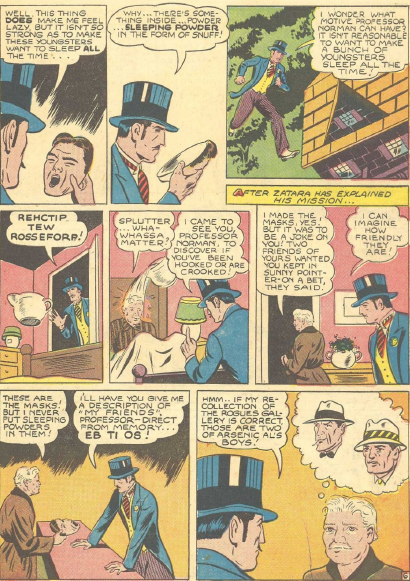 The story ends on a very odd panel, as Zatara explains why the man’s magic did not always work, an explanation that involves the man’s bugging eyes, and really makes very little sense. 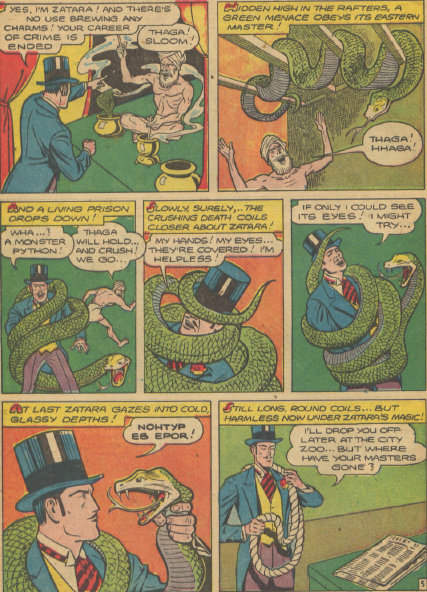 Zatara has also used his magic to wipe the man’s mind of his secret. 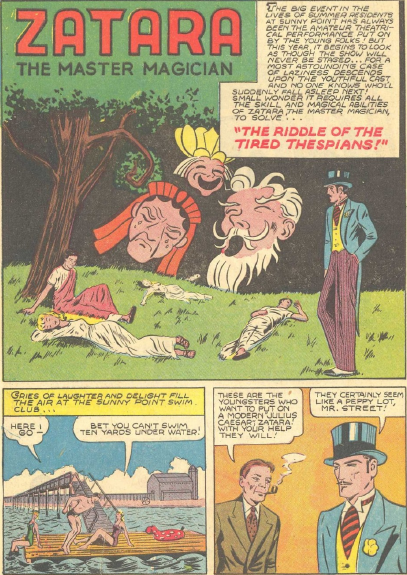 Mind-wiping would seem to be a Zatara family trait.